In 1975, news of an exceptional discover in Palmyra rapidly made the rounds within the scholarly community. Digging the ruins of a small sanctuary, archaeologists from the Polish Centre of Mediterranean Archaeology University of Warsaw uncovered a very well preserved statue of the goddess Athena, identified in Palmyra with the tribal goddess Allat. This Arabian deity did not hold a leading position in the Palmyrene pantheon, yet was deeply worshipped by the local Arab tribes. 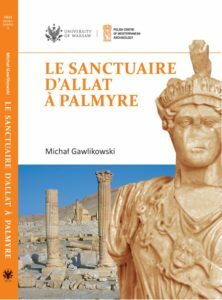 The book by archaeologist Michał Gawlikowski, the excavator who made the discovery and lecturer at the University of Warsaw, eminent scholar and expert on Palmyra and its antiquities, brings an in-depth study of this statue, set in a detailed examination of the architectural evidence for the sanctuary itself, which existed from the 1st through the 4th century AD. The author reconstructs successive stages in the development of this cult place and the respective architectural decor. The volume, in French, is an excellent example of an interdisciplinary approach to the study of archaeological excavation data, compared and critically analyzed in the context of a discussion on epigraphic and numismatic sources, reaching also into the fields of art. history and religious studies.